Ecco Bella Leave-On Invisible Exfoliant & Blemish Remedy is basically an acid-based exfoliating solution with 8% of AHA and BHA. A powerful stuff, but it is the least irritating treatment that I've experienced especially considering the potency of it. If you're used to acids like me, you can go ahead and apply this all over your face and neck, although Ecco Bella warns you clearly that you should avoid the eye area and eyelids. If you're just getting into an acid regimen, start using it 2-3 times a week and observe how your skin reacts. My guess is that you will do just fine. This treatment went through several reformulations (at one point, the liquid was as dark as coffee), and the current version is yellow juice with some viscosity. The glass bottle isn't all that convenient because it doesn't come with a pump. It doesn't have a head cap either so it is not easy to pour just the right amount for each use. I kind of like the frosted glass exterior and have learned to work with the bottle, but I may be feeling more easygoing about it because I just love what it does for my skin. Honestly, I do not know how effective Ecco Bella Leave-On Invisible Exfoliant & Blemish Remedy is for blemishes and breakouts. I have not really used it as a spot treatment. I usually apply a generous amount all over my face and neck even when I am pestered by a few hormonal breakouts. It seems effective for those, but I've also read a few reviews that the solution isn't all that for cystic acnes. Now, for an exfoliant and anti-aging treatment, Ecco Bella Leave-On Exfoliant & Blemish Remedy is SUPERB. I started feeling the difference from the next morning. No joke. It is slightly sticky but runny enough to spread easily and even mildly moisturizing. Currently, I am rotating this with a retinol serum, but this could be a standalone anti-aging treatment for me because it contains many different antioxidants and vitaminCells that are gentle on skin. 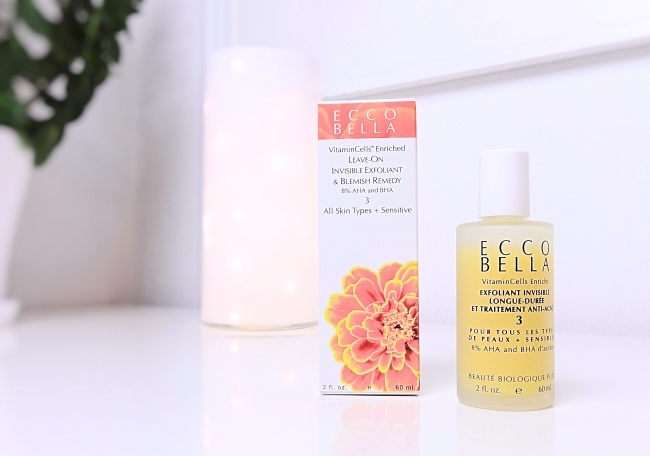 There are countless acid-based exfoliants in the market but to me, Ecco Bella stands out because of its gentleness. It keeps my complexion smooth and hydrated but I never feel that my skin is more sensitive because of it. Regardless the retail source of your choice, I'd highly recommend Ecco Bella exfoliant (see, I'm tired of typing the whole name by now) to anyone who wants to include a multitasking solution in his/her skincare routines. Thanks for reading this text-heavy post! What is the single most effective skincare item you have tried lately? This sounds like a phenomenal AHA & BHA product! I'd have to work my way up, even as a spot treatment I've been burned by a lower % of BHA. Will def use your referral for iHerb, there are so many goodies I've always wanted from this site, esp more obscure Australian and NZ products. My single most effective item lately is Manyo Factory Overnight Miracle Pack. Have been super lazy at night and still wake up with some nice plump skin with just that one item! Well this sound like a great brand and great products for the skin care routine. Thanks for share with us! I've been ordering some things from iHerb as well. I have to remember this brand. I sometimes get hormonal breakouts as well, and for some reason, my nose is always the target. Hahaha!